It looks as though the last debate really did turn things around. Had Le Pen behaved herself, she might have met expectations. But her self-redemonization sank her. My optimism about German flexibility on austerity may have been misplaced. Merkel has thrown cold water on Gabriel's more effusive statements about the need to jettison fiscal orthodoxy and fund a Franco-German investment fund. Remember, however, that she faces an election in September and has to play to the galleries. But nothing much will happen before autumn. 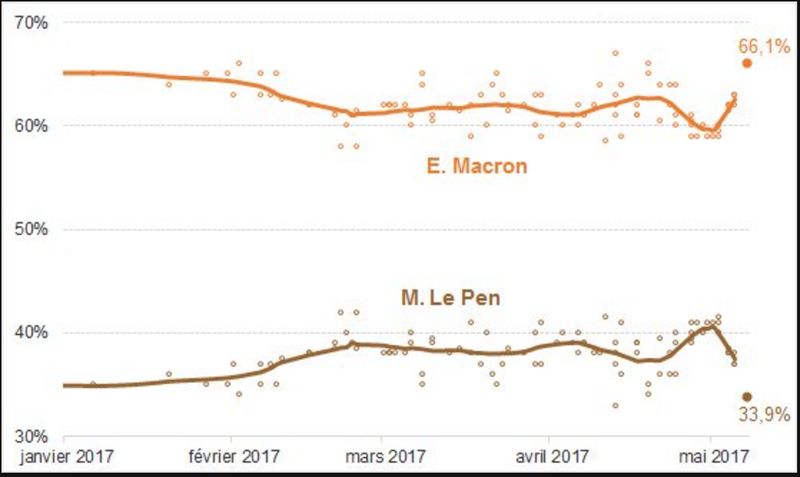 Meanwhile, Marine Le Pen is under increasing fire from within the FN. I expect she will soon sacrifice Philippot in the hope of saving herself. Manuel Valls announced this morning that he will run for the AN on the République en marche ticket (this being the new name of En Marche!). He said his "values" continue to be socialist, but the Socialist Party is dead. Meanwhile, Hamon seems to be looking (still) for some kind of alliance with Mélenchon, presumably this time as a humble supplicant. 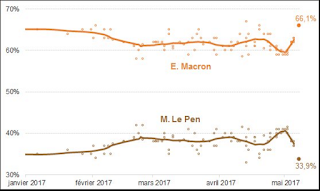 All this suggests that the rumors that Macron will turn to the right for a PM make political sense. The PS is in full disintegration mode, and he really needs to prevent LR from regrouping as a unified opposition bloc. But my guess is that he will not want to put himself too much at the mercy of the Juppéistes either. Look for a surprise, such as Sylvie Goulard, whose European credentials and gender would better suit the renewal theme (and also allow Macron himself to dominate the domestic agenda). Meanwhile, even the CFDT is putting Macron on notice that he'd better not be too high-handed in pressing labor code reform. Finally, the Harvard Gazette interviews me on the election.